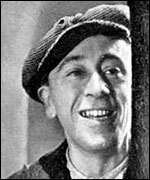 Lugubrious, shifty, aggressive, occasionally chirpy, Cockney Gordon Harker , of the protruding lower lip, was a cherished fixture in British films for 30 years, starting with several appearances in fellow-EastEnder Alfred Hitchcock 's films, including The Ring (1927), The Farmer's Wife and Champagne (1928). He was extremely busy throughout the 1930s, in such popular thrillers as The Ringer (d. Walter Forde, 1931) and Rome Express (d. Walter Forde, 1932), as well as ex-convict Faker Brown in the wild comedy of Boys Will Be Boys (d. William Beaudine, 1935). He starred as Inspector Hornleigh (d. Eugene Forde, 1939) and in the sequels, Inspector Hornleigh on Holiday (d. Walter Forde, 1939) and Inspector Hornleigh Goes To It (d. Walter Forde, 1941); did a lovely cameo as a casually corruptible pub-keeper in Bang! You're Dead (d. Lance Comfort, 1953); and starred in his penultimate film, Small Hotel (d. David MacDonald, 1957), as the devious waiter, matching wits with Marie Löhr , in the role he had created on stage, 50-odd years after entering the profession as prompter to Fred Terry . A stocky tower of strength in over sixty films, it is good to know he had the chance to play Alfred Doolittle in an early TV performance of Pygmalion (1948).